Safety Boss Inc., in support of Project Warmth Society of Alberta, has donated $42,000 worth of supplies including 96 military grade sleeping bags, 45 Air Mattresses, 250 Water Proof Bags and 56 Luggage Bags. Working with the community, Safety Boss Inc. is proud to be able to help those in need all year long but mostly during our coldest months. Jonathan Fesik of The F.I.R.M. in Calgary, works closely with Project Warmth Society of Alberta and referred us to this wonderful project. We would like to thank Ryan Richmond, Safety Boss Inc. Industrial Safety Manager, and Curtis Wright, Safety Boss Inc. Red Deer Station Manager, for taking the time to inventory, prepare and deliver the donated supplies to The F.I.R.M. We would also like to thank Jonathan and his team from The F.I.R.M. for professionally cleaning all the donated supplies and delivering them to Project Warmth Society of Alberta. We, as a company, are happy that we were able to assist and help those less fortunate during hard times. Please visit the Project Warmth website to learn more about this needed charity. You can also find out how you too can help. 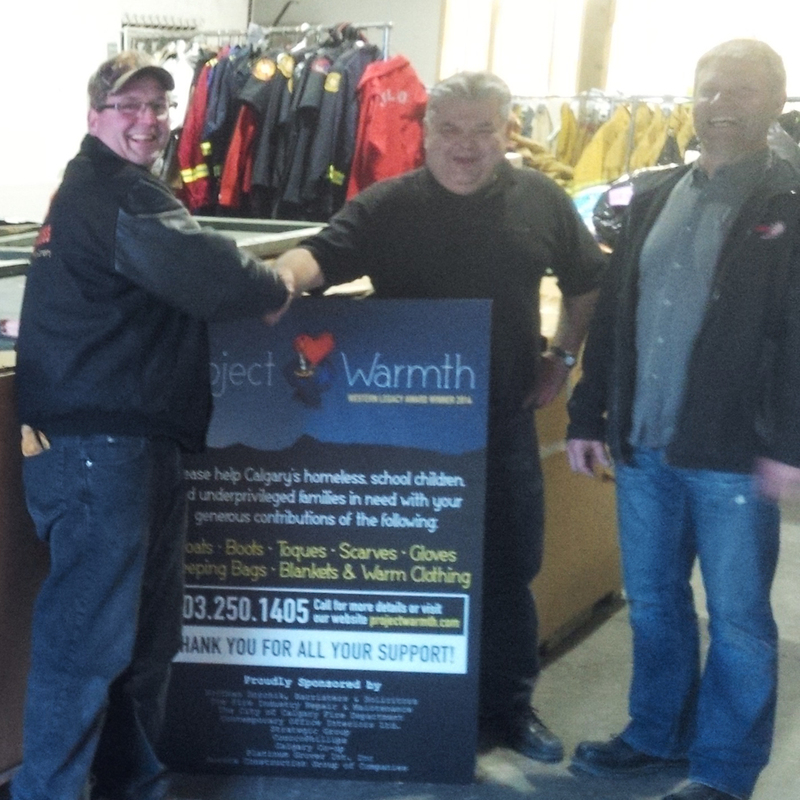 Project Warmth Society of Alberta is a registered charitable association. The association was formed to assist the homeless and the underprivileged. Blankets, gloves, sleeping bags, scarves, parkas, and items of warm clothing are gathered and cleaned for distribution to those in need. Bins are placed in the many fire stations and halls throughout the City to accommodate the clothing and related items. Arrangements have been made for the pick up of items which people wish to donate.